Astrium's geologists offer a comprehensive range of onshore geological mapping services to the oil, gas and minerals industries, including structural and lithological interpretation and detailed fracture analysis utilising various sources of satellite imagery and digital elevation models. Geological interpretation can be performed at a range of scales, from regional down to individual structure or prospect scale. In order to build up a full geological understanding of a region. 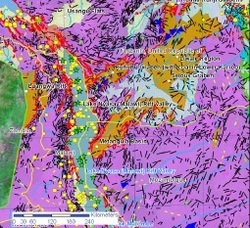 The studies are performed within a GIS to facilitate integration of ancillary exploration data such as potential field, seismic and well data supplied by the customer. Astrium Services can also offer a field geological mapping service allowing interpretations to be verified and integrated with primary data. For regional evaluation and seismic planning, Astrium offers non-exclusive studies that have been carried out at scales ranging from 1:50 000 to 1:250 000 and supplied in GIS format. There are also provided follow up detailed studies over block specific areas. Iraq: Regional structural interpretation of northern and southern Iraq carried out at scales ranging from 1:250 000 to 1:50 000 in areas of structural complexity. Iran - Fractured reservoir study of the Zagros Simply Folded Belt of Iran, regional synthesis of the reservoir quality of fractured carbonates.